One brick is the memory of our past experiences which might lead us to believe that the future will be just the same. And look, there’s another one! A repetitive pattern of relationships with our life partners… Partners change, but we notice that our behavior pattern remains the same in each new relationship. Sometimes we are so afraid of the fear itself, that we build an additional layer into our wall. This layer is made of addictions, distractions or self-imposed illusions, carefully designed to block the view of our own fears. And then we might indulge in self-pity, victimhood and a belief that we are too weak to break through the wall. The wall appears more real than anything we might find beyond it. The possibility of freedom beyond this wall became a myth, while the wall became “all there is”. And what could be awaiting there, beyond the wall? An opportunity? A fresh start? The freedom that we’re longing for? But the wall itself is not the point of this article. Most of us are familiar with our own limitations and work very hard to find our way out, over or beyond this wall. Some of us go to therapy and try to smash the bricks one by one. Others attend self-improvement courses in order to change their habits – the stuff most bricks are made of. Some read books or watch YouTube presentations to expand their worldview, and others travel the Earth, trying to run away from the wall. To me, this all sounds more like rearranging the bricks of our own wall than anything else. Even worse, it seems that all this self-inquiry, soul searching and self-improvement becomes an addiction in and of itself. We invest so much of our time and energy to reshape the wall that we forget that our initial intention was actually to go beyond the wall. What if you don’t have to work so hard to break this wall? What if there is another way to go through it? What if you don’t have to DO anything (yes, anything…) to overcome this wall? To touch the magic that lies outside of it. To enjoy the freedom, inspiration and limitless potential that awaits us on the other side. Instead of constantly bashing our heads against this wall, perhaps there is an easier way… Maybe, all we really need is to recognize the opportunities that we receive absolutely for free and to use them to our own advantage. They do. All the time. The simple mechanics of our perceived reality dictates that things get built up and then they break down. Everything is subject to cycles of change and transformation. Nothing is forever solid. It is true for Nature and it is true for our everyday life. A colleague at work quits or loses his job. An opportunity to reshape how things are at a workplace that was starting to feel like a cage. Your life partner is offered to relocate. A possibility to either follow him or her to a new place with new options for yourself, or to enjoy some time alone, perhaps even maintaining your relationship remotely. Your car breaks down and you are forced to use public transport for a while. You can observe new faces on the street. You could be inspired by the change in your circumstances or you might make a new friend. The Internet connection in your apartment is not available for a week due to a technical failure. It’s time to visit that park next to your house and watch the ducks instead of gazing at the screen. Who knows, maybe the good old way of contemplating on a bench can bring better results than googling “junk-thought-food” of pre-cooked answers to your inquiries. A big old dinosaur company files for bankruptcy because of its own inefficiency. You, as a freelancer or a small business owner, suddenly might get access to a huge pool of customers that just lost their main service provider. The political climate in your country has changed. The new political regime might be favorable to the business that you own or on the contrary, might give you that last push to pack your belongings and move to the place of your dreams. I’ll share a story of a crack that appeared in my wall one day, completely out of the blue. But first, I’ll describe the wall that surrounded me for over a year at one of my workplaces. At the time, I was working as a logistical manager for a real estate company. I was doing a good job, being very thorough, careful and precise, bringing innovation and passion into the workplace. However, as many people experience in similar situations, I felt that I wasn’t being properly compensated for my work. It seemed as if I was bringing much more value than I was getting back in the form of a paycheck. In short, I desperately wanted to get a raise. My problem, or the brick in my wall, was that I did not know how to approach the company’s CEO in the right way, how to describe to him what I’ve been doing and why my input was worth much more than what I was receiving. I was afraid that I will not find the right words and will either miss my opportunity to get a raise, or worse, be ridiculed. I was struggling with this distance between “little” me and the “almighty” CEO that seemed always too busy to have a conversation with me. There was a wall. In my attempts to get through this wall I was reading articles about “Salary raise negotiations” to try and develop a strategy. I was looking for information on average salaries of similar positions in my industry to try and justify my claim. I was having conversations with friends about this issue in which they brought up some suggestions, but I couldn’t really use them, because the fear clouded my thinking. My own wall of doubt was closing in on me. For over a year I was rehearsing a dialog with the CEO in my mind. Sadly, this inner dialog always ended unsuccessfully, which made me angry with him and with myself. Silly me, I know. The thoughts we have in our minds and our own ability to believe them, can sometimes be astonishingly ridiculous. For over a year I was staring at my wall point blank without any idea of how to get through. One day, my direct manager notified me that said CEO, is retiring from his position and leaving the company. In an instance, the entire energy field around me changed. I felt that the distance between me and him suddenly ceased to exist. He is no longer the almighty, always busy and scary CEO. Now he is just a guy who is quitting his job. I’ve noticed a crack! The week after that, I was at his office, still nervous about the situation, but I was there, knowing that the guy is leaving and he doesn’t care anymore about budgets or pushing his employees to prove themselves in order to get a raise. I had the opportunity for a ‘heart to heart’ talk with him about me and my position in the company. A week later, he personally notified me that he approved the raise that I was requesting, effective immediately. On the 1st of the next month I received the salary that I wanted. Several days later he was gone and I never saw him again. 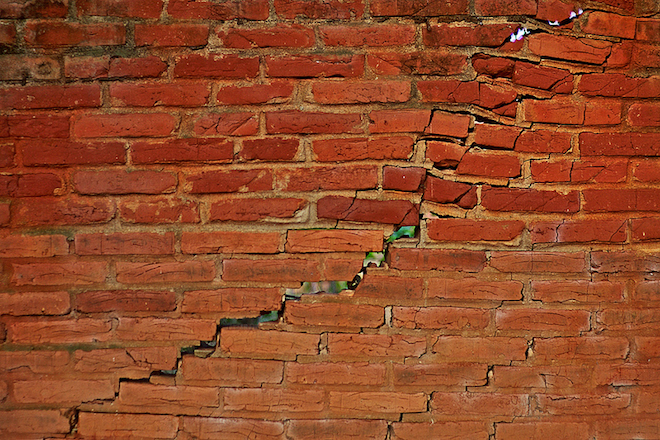 The reality is – in any wall there are more cracks than bricks. 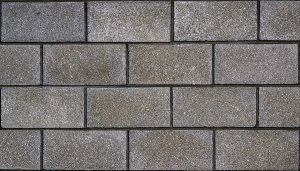 There are 12 visible (full) bricks and 15 visible cracks between the bricks. And I’m not even counting the cracks on the edges of the picture. Sometimes the changes in the world around us are so vast, that cracks appear not only between the bricks, but also through the bricks, breaking them in smaller pieces. That’s when our beliefs or world views are suspended, allowing us to enjoy some “freedom OFF belief”. Now, the magic of this phenomenon is that it happens without our direct intervention. Did we actively do anything for those cracks to appear? It’s zero investment on our part. The wall is not the point of this article. I believe you’ve observed the bricks of your wall long enough. It’s time for you to start noticing the cracks as well. It’s time to stop hitting your head against the brick wall and to start slipping through the cracks. One of Bruce Lee’s most famous quotes is: “Be water, my friend, be water”. Copyright © Hermetic Vision 2015-2019. All Rights Reserved.